All-access spectator passes $30 at the gate. (CASH ONLY) Kids under 16 free. Track Configuration: FULL COURSE! 2.75 mile, 19 Turns and 200' of elevation. 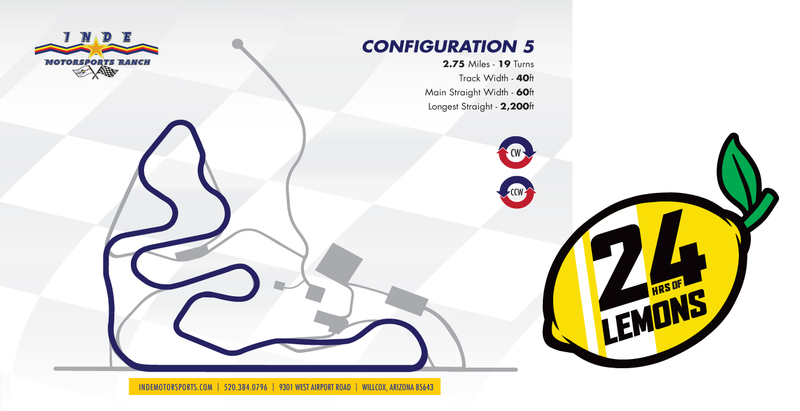 See configuration #5 on the Inde Motorsports Ranch website. FRIDAY TESTING: 1pm-5pm: $250/car and unlimited number of drivers. Signup link here. Testing drivers' meeting at 12:30pm. 1pm-7pm: Early arrival. If you want to camp Thursday evening the track will charge $30 per camper/vehicle. No admittance after 7pm, and if you leave you won't be able to return until 7am Friday morning. 1pm-5pm: Mandatory Friday tech inspection. All cars and at least one teammate must be present. 1pm-5pm: IMR hosted pre-race testing. Details above. 5:15pm: Rookie Meeting: Meeting for Lemons first-timers. Location under the awning at the Penalty Box. 5:30pm: All military jets on property taxi down to the front straight and take off. Get out quick. Overnight camping allowed, Gas or enclosed BBQ's OK, no open flames. Note for campers: Front Gate open nightly until midnight, then closed until gate open time next morning. Limited number of RV Hookups at $30/day. (Plenty of room for self contained camping.) To reserve a spot email John@indemotorsports.com. Fuel sold on-site. Yes, 87, 91 and higher sold on site by Inde (from drums.) NOTE: CASH ONLY for fuel purchased from INDE on site. 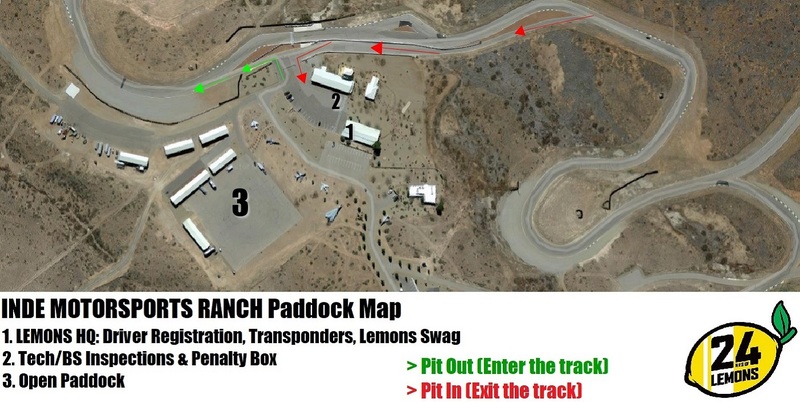 Bring a method to transport fuel from the paddock to the hot-pit lane (about 1000' distance). Vehicle Restrictions: Except for street vehicles coming to or leaving the facility, no motorized vehicles may be used on track property from one hour after the checker/on track running until sunrise. No Razor-type scooters. NO RACE MOTORS BETWEEN 6pm and 8am! Food: Inde doesn't have any food vendors. Bring your own supplies.